Pretend it's all the kids' idea to spend lazy days around the lagoon-style pools. Even the grill master gets a great view. Fill your basket with indulgent treats from every aisle. The island-inspired treatment menu will have you planning a return visit before you leave. The sunset is amazing in a different way every night. High-end gourmet kitchens take the chore out of cooking. You're a two minute drive from Kiahuna Golf Club. Tiki torch lit paths wind around Koloa Landing Resort at Poipu, Autograph Collection, a twenty-five-acre tropical oasis filled with natural water features, living ponds and two ocean access walkways. Stop by your condo and start rummaging through your luggage for your swimsuit, sunblock and goggles. Then visit the on-site gourmet marketplace for island pupus before staking out your turf alongside the elaborate family and adult pools and the hot tub. When it’s time for lunch, take advantage of the poolside bbq grills. Let the little ones help carry hot dogs, burgers and sides and get ready for a fun family cookout. Up for some recreation? The resort has a volleyball court, a soccer field, and a putting green. Get your cardio on at the well-equipped fitness center and treat yourself to a post-workout massage, facial or body treatment at the on-site World-Class Spa. The spa is a must-book, offering natural treatments from Hawaii’s premier luxury beauty brand, Malie Organics. Studio condos sleep four guests and have kitchenettes with a mini fridge, stove and microwave. One- to three-bedroom condos sleep four to eight guests and have in-suite washer/dryers. Get in touch with your inner-Betty Crocker and bake up a batch of your famous chocolate chip cookies in your full kitchen. You shouldn’t have any trouble convincing the little ones to assist – and make sure that the chocolate chip-to-cookie ratio is correct. You’ll be amazed with all of your in-suite entertainment options. Catch up with your favorite show on the Smart TV with premium cable. It also has Netflix, so if you have a Netflix account, you can log in right on the TV! Be sure to pack some of your favorite movies from home, DVD players are perfect for family movie night. Get everyone assembled on the couch with a selection of snacks and get ready to be entertained. Condos offer Resort, Ocean and Partial Ocean Views. Gather your group for the five-minute stroll to The Shops at Kukuiula Village for local art, boutiques and handmade ice cream – ask for tiny-spoon samples of at least three flavors. Poipu Shopping Village is home to unique shops and restaurants. Fish Eye Kauai is an art gallery with featuring one hundred percent local artists. Whalers General Store has Hawaii souvenirs. Soul Lei features accessories and clothing that change colors in the sun. Enjoy a Hawaiian-style hot dog at Puka Dog, tacos that feature local Hawaiian flavors at Island Taco or local fish at Olympic Cafe. If you need a mid-afternoon pick-me-up, stop by Starbucks for a latte or frappuccino. Golfers? 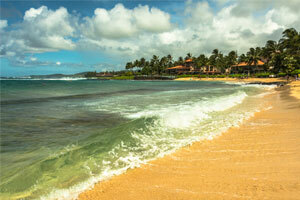 You’re minutes from Kiahuna Golf Club. Adventurers? Conquer the Waimea Canyon or Na Pali Coast. Or head for Koloa Landing for kayaking, fishing, scuba diving, snorkeling, and whale watching. Kids stay free! Up to 7 children under 18 years old stay free when using existing bedding.